The picture below is making the rounds online. 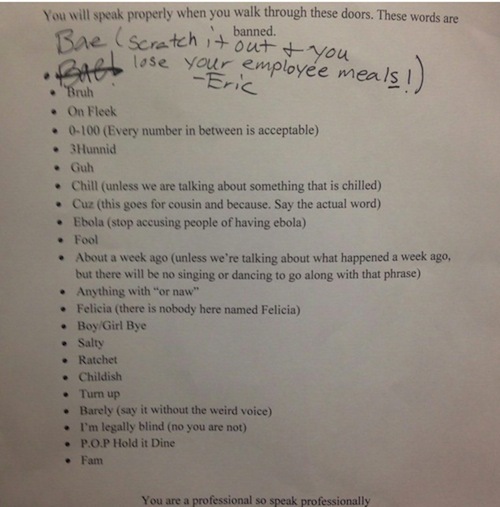 It is rumored to come from a Chick-Fil-A restaurant where a store manager is trying to ban certain slang words. The frustration in the manager's tone is obvious and, frankly, hysterical. If you aren't, however, a hip millennial, you may not track with what these comments even mean! I appreciate this list, but I'm not sure it takes the ban far enough. I reached out to my usual "blogstorming" group and asked them to help me compile a list of the slang they would most like to ban. Yaaaah - No need to ruin a perfectly good "yes." Rawkin - I don't think anyone says this really. Do they? Dork alert! Obvi - You sound like a Jedi when you shorten obviously which you obvi aren't. Besties - even middle school girls have moved away from this term, so should you. I can't even - then don't try. Freaking anything. As in: No Freaking Way. Actually anything used in place of the F-word just needs to stop. We all know it's just F-Word Lite. And nobody's grandmother wants to hear any version of it. TBT - when it's not a photograph posted on a Thursday. Hashtag -- You can use the # symbol, but don't say "hashtag" when you're speaking. You sound like a SNL skit! Amazeballs -- this is so 2012 - old enough that it's new again. I admit I still like the word but it's still obnoxious. YOLO - unless you're talking about a brand of paddle boards! To tell you the truth - I mean I hope you already do tell me the truth. Seriously. No. Seriously. - just stop. Shut UP!!! - Or perhaps, stop saying this. NO WAY! - Yes. Way. Holla! - I don't need to explain why this should go. OMG - The most obnoxious acronym of all. Seriously. No. Seriously. What slang expressions would you like to slay?